This past weekend my husband had to work at his part time/second job so it was just me and my boy all weekend. While we LOVE having daddy around, we also love to have some time alone together so I'm always excited for these weekends to come. Sunday came around and we had a lazy morning of breakfast eating, laundry washing, and cartoon watching before we headed off to Gymboree at 10am. 10am came around and we were off. We had a great time playing at Gymboree and as usual, I'm sure I ended up more tired than Mason did. After Gymboree we stopped at Costco on our way home. Mason was such a good boy. He ate the snacks that I brought for him as well as eating some crackers and cookies that they were sampling. We went to a different Costco than we usually go to and I might think about going to this one more often...they had so many good samples! We got all of our things and headed to the check out line...which is always longer than long. Thankfully they move quickly though. As we were waiting, Mason being the sweet boy that he is, sat in the cart and sipped on his juice and when he was done, stuck his arm out and offered it to the lady behind us. Bless his little heart. She must have looked thirsty or something, but she politely declined when he offered her his cup. So since she said no, he gave it to me and I put it in my purse while we checked out. We finished up and headed to the car to go home. ...he pulled down the Cheeto container and is eating them off the floor and straight out of the can. Apparently he is too hungry to wait for his lunch, he needs Cheetos (the Gerber Cheeto like crunchies) now! So, nicely I say to him, "Mason...we can't eat Cheetos before lunch." And what does he do? Picks up a Cheeto, sticks his little arm out, and puts it in my mouth. And then what happens? The same thing! Picks up a Cheeto, sticks his arm out, and puts another in my mouth. And I can't help but smile again. I tell him it's time to clean up and what does he do? I mean, really? 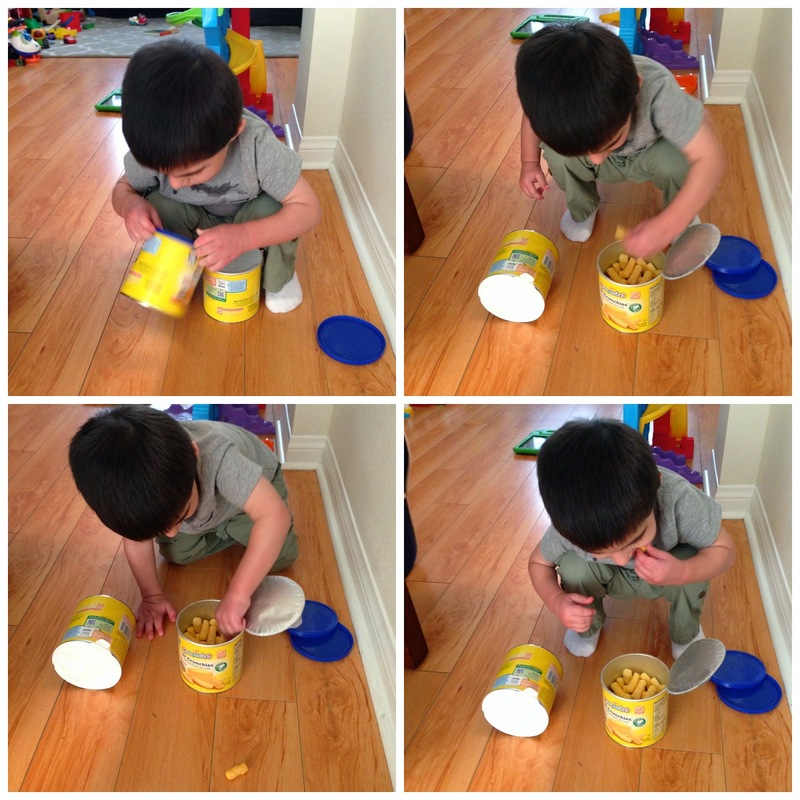 How can I be mad that he knocked the stuff off the counter and that he's eating snacks before lunch? I can't. Seriously. I wasn't mad at all. Instead? My heart was exploding with love and happiness and pure joy that this little man belongs to me.